【TIMELY&EFFECTIVE DOG BEHAVIOR TRAINING COLLAR】 Whether in state normal or standby, push-to-effect immediately, no need to wake up. Wiscky dog training collar can be used to help correct excessive barking, walking, sitting, pee, leash aggression, towards other dogs aggression and other behavioral obedience. 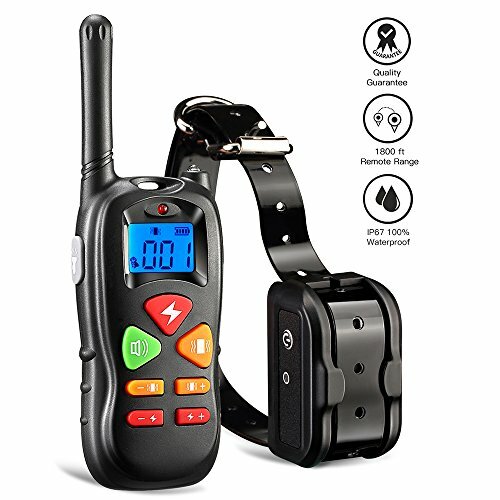 【LARGEST REMOTE RANGE】Up to 1800ft barrier free remote control range, makie it easy to train your dog with Wiscky Electronic Dog Training Collar in the park or backyard, never worry your dog runs too far and just enjoy the outdoor life. 【Easy to Operate】- Electric dog collar with separated sound, vibration, shock and adjustable up-down buttons, letting you quickly switch and make faster without confusing complexities. 【Safe, Multiple Training Modes】 - Wiscky dog training collar features 3 efficient and safe training modes (beep, vibration and shock) with levels 1-100 for progressive behavioral obedience. Extra conductive silicone keeps collar skin contact safe.